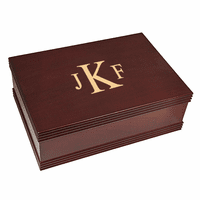 FEATURES/SPECS This monogrammed rosewood keepsake box is large enough to hold a bunch of papers and small trinkets and stylish enough to look great in any room in your house. 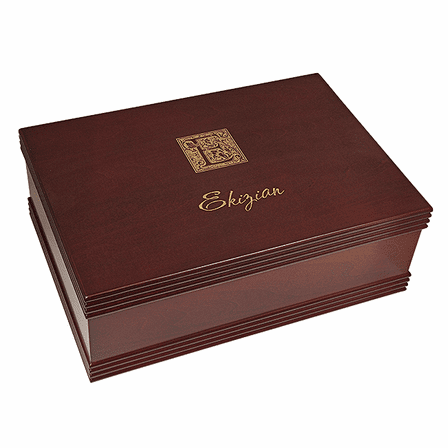 The box itself is made of solid wood with a rosewood finish. It has stylish beveled edges along the top and bottom of all four sides. The box has brass hinges and a black velour lined interior. The lid comes with a laser engraved monogram of your last initial along with your last name engraved in a fancy script font. Of course, it doesn't have to be your monogram on this keepsake box, it makes a great gift for someone special as well! Is there any black velour on the bottom of the box so it won't scratch my dresser ? Yes, there is a black velour pad on the bottom at each corner (four total). What are the dimensions of the inside of the box? Can a logo be engraved on this box instead of the last initial? I will be ordering this for my boyfriends birthday but I would like his full name on the box is that possible? Is that doable? 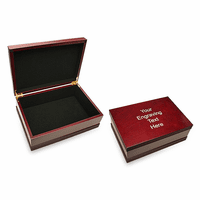 It is, we have the same box available with fully customizable engraving here: http://www.executivegiftshoppe.com/b572s.html . You can have a name engraved on this keepsake box. Is it possible to order this without the last name and just the initial in the middle? Yes, just let us know in the comments section of our checkout page that you only want the monogram initial. Also, please specify what the letter initial will be in the comments section. Nice quality. Very red stain. Nice lining. Note not included as requested. Would purchase again. The product is beautiful and of exceptional quality. But even more, the customer service was phenomenal. I had one small issue with my order, reached out to them, got immediate response and full resolution (more than generous for my trouble) with product in hand within 2 days! They truly do stand behind their products. Will definitely be purchasing again. Will make great graduation gifts! Purchased this box to honor the retiring CEO of our organization. The box is perfect....sturdy, attractive and just what we were looking for. In addition, we were very pleased with customer service. I ordered online and made a mistake when doing so. I called customer service and they were pleasant and helpful in fixing my error and sending confirmation. The box arrived quickly and is a great gift (filled with notes) for our CEO. The box is beautiful the craftsmanship and the engraving wete excellent and better than I expected. I can�t wait to give this box to my son and daughter-in-law. Very nice box- smaller than what is described. Overall the box is very nice and the engraving is very detailed. Physically, the box comes as pictured and is nicer in person. 4 stars just because the dimensions shown in the description are for the outside of the box, not the interior. I have this very old/rare book I wanted to keep in the box and it's just not big enough. I wish the website made more of an effort to give you all of the dimensions because now I have a random box and I can't return it because of the engraving. 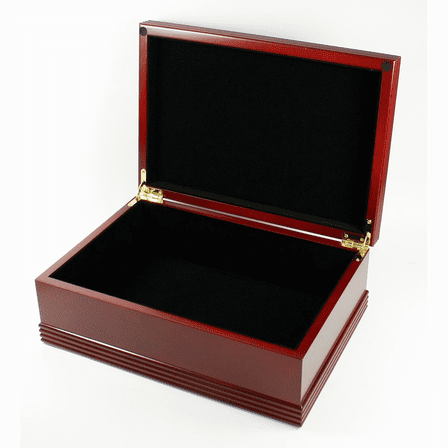 ProsPerfect size to hold sentimental keepsakes. This is so pretty and the engraving looks great. It is nicer than pictured. So glad I found this company. I am ordering other things. The quality is great. Fit and finish were of high quality, and we appreciated your flexibility with wording for the inscription.. I am completely satisfied with this keepsake box! It is not only beautiful, but also well constructed!